Last May, Zev Eleff PhD’15 delivered the valedictory address on behalf of all doctoral recipients at Commencement. In the four months following, he has achieved a great deal of success, both academically and professionally. 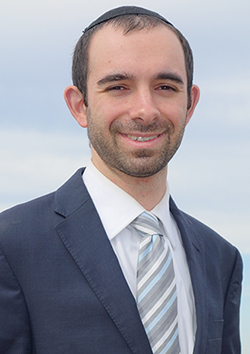 Earlier this month, Dr. Eleff was named the 2015 recipient of the Salo Wittmayer Baron Dissertation Award in Jewish Studies by Arizona State University. The honor, which carries a $5,000 award, is given every three years to the best dissertation in the field of Jewish History and Culture in the Americas. It will be presented at the annual Association for Jewish Studies conference in Boston this December. Dr. Eleff received a unanimous recommendation from the award committee for his dissertation, “Power, Pulpits and Pews: Religious Authority and the Formation of American Judaism, 1816-1885.” The committee described the dissertation as “an excellent piece of scholarship on an interesting and important topic” that “deepens our understanding of the mechanisms that shaped the emergence of the rabbinate in America.” The dissertation argues that rabbis, as religious authorities, gained greater power in the American synagogues toward the end of the nineteenth century. As a result, Jewish lay leaders started to absent themselves from the very synagogues they founded and looked for other venues and arenas to exercise authority, such as community centers, Jewish publishing companies, and Jewish colleges. A revised version of Dr. Eleff’s award-winning dissertation is under contract to be published by Oxford University Press next year. It will join his other publications, which include five books and more than thirty scholarly articles. Dr. Eleff says the topic was the result of a series of conversations with Jonathan Sarna, the Joseph H. & Belle R. Braun Professor of American Jewish History. “We began discussing various ideas. Over time, the theme and thesis sharpened into the dissertation topic. This is a testament to the devotion of Dr. Sarna to his students,” he said. Dr. Sarna notes that the dissertation was made possible in part by the Brandeis Library’s recent acquisition of online Jewish American history databases. Dr. Eleff was appointed Chief Academic Officer of Hebrew Theological College in April, where he is responsible for all academic programs and new areas of educational development for students. He is also an Assistant Professor of Jewish History at Touro College and University System and a member of the Academic Council of the American Jewish Historical Society. Even with all this success, the Salo Baron Award holds a special significance to Dr. Eleff, who regards being associated with the pioneering figure in academic Jewish History among the highest of honors. Dr. Sarna agrees that “It is a great tribute to everyone involved that one of our students has been selected for this distinguished award," which is made possible by a generous gift from Dr. Shoshana B. Tancer and Robert S. Tancer. Dr. Sarna regards this dissertation and forthcoming book as a milestone in his quest to turn Brandeis into a great center of scholarship in American Jewish Studies. “Dr. Eleff's dissertation is the 27th that I have helped to supervise at Brandeis over the past twenty-five years, and I expect his work will reshape the way we think about 19th century American Judaism."